At IH Bristol Foreign Languages http://www.ihbristol.com/languages/department-of-foreign-languages , we’ve been improving our understanding and use of online learning. It can be hard for teachers to keep track of all the resources that are useful to our students. And we have found that so many useful learning tips and tricks can get lost or buried under a mountain of handouts we can’t find! So I thought of developing a blog for our students, and have also learnt how to use a Virtual Learning Environment (VLE) to supplement our classes. Our students have given us positive feedback about these changes. I am currently studying for an MA in Library and Information Studies, as I work in a university library as well as being a Welsh Tutor at IH Bristol. I was learning about lots of very useful resources as part of the MA, and saw how these could be used in my job at International House! Target audience: all our Foreign Language students. Blogs are so common nowadays, and a useful way to share ideas and information with students, as well as encouraging them to contribute! Most are free as well. As we teach numerous foreign languages, we thought it would be better to make it relevant to all the students, and to cover aspects of learning a foreign language. So the posts cover aspects of language learning in general, rather than specific languages. 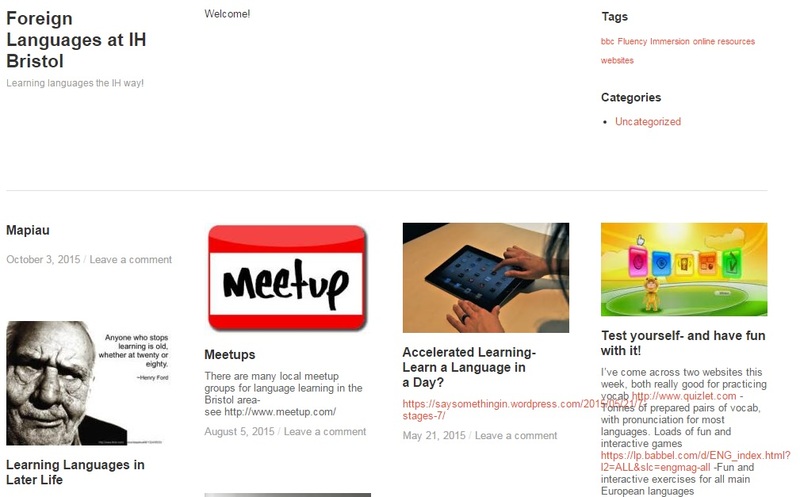 Some teachers would like to post on individual languages, so we’re exploring doing this by using categories and tags. Another solution is setting up a separate blog for each language, as I did for Welsh here https://cymraegbryste.wordpress.com/ . We organised a training session as part of our frequent Teacher Meetings, where we all tried posting onto the blog. We are all encouraged to write blog posts, using the same login details. We initially all tried setting up accounts and asking for administrator rights, but it worked out much simpler to set up one School account, and then all log in and post using that account. Some teachers were well aware of blogs, whereas for others this was new territory, so I had to try to avoid using specialised jargon. I also offered follow-up training or chats for people who still felt unsure after the session. We haven’t publicised the site yet much with students, as we are still getting to grips with using it ourselves. But the students I’ve shown the site to like the look of it, and are appreciative that there is an extra resource they can tap into between the lessons. There have been many exciting developments in technology in all levels of education, and one of the most exciting is the Virtual Learning Environment (VLE). 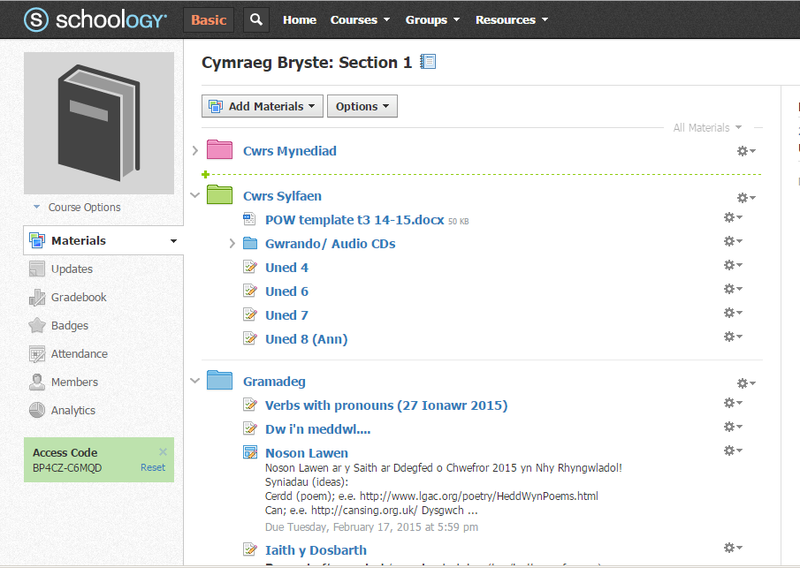 Universities mostly use Blackboard, but we chose to use Schoology, as it is free and has a friendlier feel for students. It is also free to use. Many of my students are over 50, and have never encountered online learning platforms before. 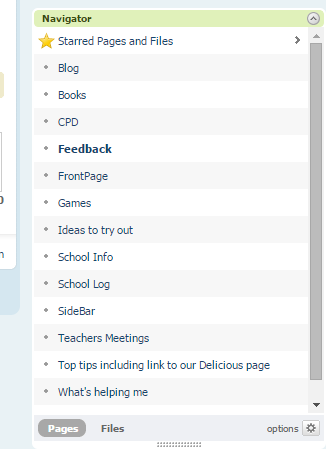 However, I am finding that they are happy to use Schoology as they realise it offers them a lot of advantages. Their largest hurdle seemed to be initially setting up the account and logging in. Instead of emailing resources to students, I can now pop these onto the VLE. This is easier for the students, as all their learning materials are in one place, and they don’t need to go searching through their emails to find resources I’ve mentioned in class. I put listening exercises up there, answers to homework, links to online dictionaries and ideas for self-study at home. It also helps me, as I know where to look for my own material! You can add private folders, which are useful for storing your own materials. Target audience: teachers to share ideas. Finally, we’ve experimented with a wiki with PBWorks. Wiki’s are a great way to share ideas amongst teachers. We’ve got an active email group where we as the Foreign Language tutors share ideas with each other informally. But a wiki allows us to store that shared information, and return to it later. I chose PB Works, as it offered a simple interface, and was easy for teachers to use if this was their first experience of contributing to a wiki. You only need an email address to access the wiki, and then I give users access. So it is a safe and secure place not open to the web for our teachers only. Wikis are very easy to set up and administer. Again, they are free for all the features you would need as a school or teacher. The basic set-up is fine for most needs, so you don’t need to spend any time on layout etc. You can simply dive in and start adding and sharing content. Figure 3- Some of the pages on our Teacher wiki with PB Works. It’s an on-going experiment with these new technologies, but it’s been fairly straightforward to develop the resources, even for busy Foreign Language tutors! It has helped to have the support of the school and our Foreign Language Co-ordinators. Author’s Bio: Julian Wood teaches Welsh to adults at IH Bristol. He holds an MA in German and Russian, and is interested in technology. Julian’s also enjoys looking at how Foreign Language students use the weekly evening classes to create structure and progression in their language learning.